Ubisoft is celebrating 25 years and at this year’s E3 they showed consumers exactly why they have such a long-standing legacy in the video game industry. Cycling back and forth between comical mock eight-bit parodies of actual games and game trailers and demos, the Ubisoft press conference was both entertaining and exciting as they previewed this year’s lineup of Ubisoft games. Here are some of the highlights from the event. 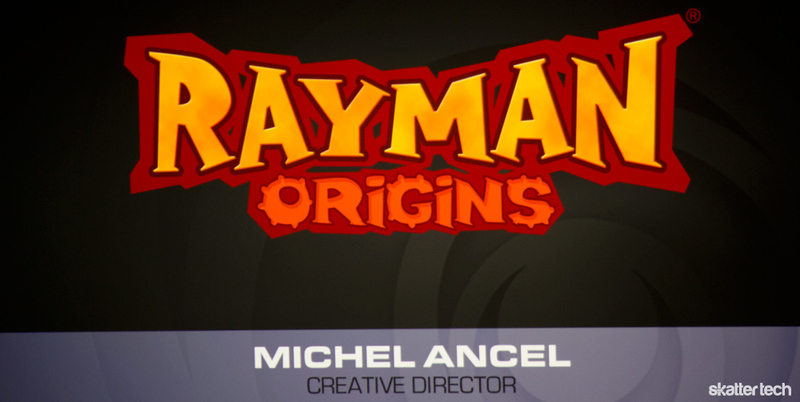 Starting off the conference with a new addition to a classic franchise, Rayman Origins set the tone for the rest of the event. Running along the 2D side scrolling platformer with Globox, Rayman maneuvered through several obstacle courses and solved puzzles, including a tetris-themed puzzle of jumping on melting ice cubes shaped in the class tetric block forms in the live demo. The new Rayman will support up to four players in the multiplayer mode. Additionally, players will now be able to harm their friends through kicking and punching in order to sabotage them and collect their points, just like in Little Big Planet. It was a fun, quirky, family-friendly game that was very well received by the audience at the LA Theater in downtown Los Angeles. Rayman Origins is due out this upcoming fall. The latest title in the Tom Clancey series, Ghost Recon: Future Soldier has been getting a lot of hype this year at E3. 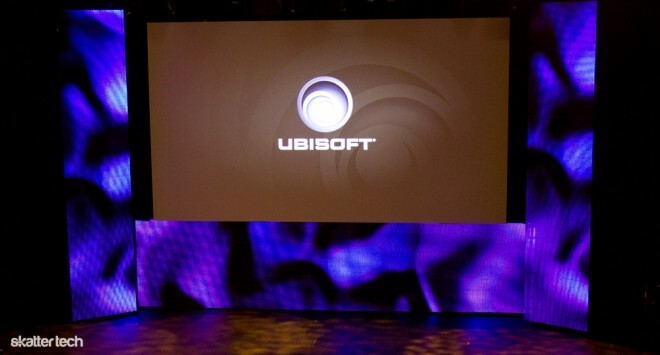 Prior to the Ubisoft press conference, it was revealed during the Microsoft media event that Ghost Recon will be used on Kinect and that users can completely modify and customize their weapons through the gunsmith mode. Ubisoft aired both a preview trailer and a live multiplayer demo of the third person shooter, both of which highlighted exciting fights, graphics, and audio, all shown through four separate gaming angles. The exciting new feature, however, was the announcement of Tom Clancey’s Ghost Recon Online, an online version of the play that is “absolutely free” to users. It is as of now unclear just exactly what this means, as Ubisoft was a tad bit vague about the details regarding this aspect of the online game, however, it seems likely that users would have access to this free game by purchasing the physical Tom Clancey’s Ghost Recon: Future Soldier game, which is set to launch sometime in 2012. There were several other games that were previewed during the conference, varying widely in genre and target audiences. Driver: San Francisco, which debuted at last year’s E3, made another appearance this year, along with another racing game Trackmania 2: Canyon, developed by Nadeo and published by Ubisoft. Other games include Raving Rabbids: Alive and Kicking, which will be used on the Kinect and features family-friendly games such as versions of Whack-a-Mole and “Fill the Shapes” and is due out on November 8, You Shape Fitness Evolved 2012 (also due out in November), The Adventures of Tintin The Game, the companion piece for the upcoming Tintin movie, and Rocksmith, a new music game which theoretically teaches players how to play guitar. In addition, Ubisoft also debuted Far Cry 3, a FPS, and Brothers in Arms: Furious 4. Ubisoft ended their conference with a bang by showing off their latest Assassin’s Creed game, Assassin’s Creed: Revelations. By far the highlight of the entire event, the trailer and demo of Assassin’s Creed: Revelations blew the audience away with the stunning graphics, intense video and game footage, and overall ambiance. New to the game is a hook-blade for an older-looking Ezio, which was used to both zip line between ships in the harbor as well as snag enemies and pull them closer for melees and other final attacks. Fighting is made much quicker and more fluid this way, and therefore much prettier to watch. The graphics themselves were gorgeous, both in the video as well as the demo, and the environment rendering was incredibly realistic at certain points. Assassin’s Creed: Revelations is certainly on par with its predecessors and will likely be a hit with Assassin’s Creed fans. 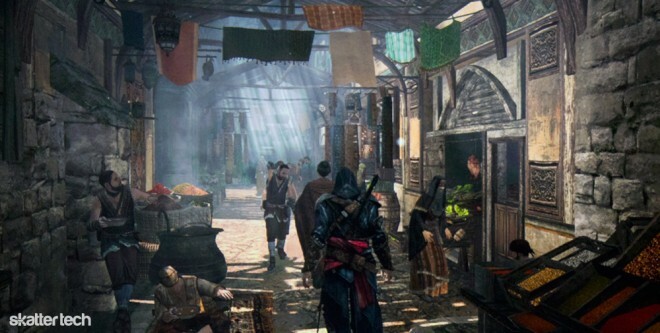 Assassin’s Creed: Revelations is set to hit stores in time for the holidays this upcoming November.